With the Ruddick recliner, there's no need to forfeit your modern style for plush comfort. A padded chaise brings you smooth comfort that extends from head to toe. The chair features simple recline functions, making it easy for you to relax after a long day. Track arms give the piece a sleek contemporary feel, complemented by the subtle tufting created by stitching along the seat back. A modern shape gives way to plush comfort with the Ruddick recliner. 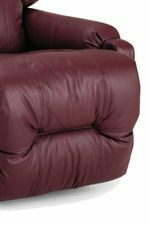 Available with space saver, swivel glider, rocker, swivel rocker, power rocker, and power space saver recliner options. 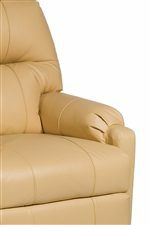 The Petite Recliners Ruddick Swivel Glider Recliner with Line Tufting by Best Home Furnishings at Best Home Furnishings in the St. Louis, Chesterfield, St. Charles, MO & Waterloo, Belleville, Edwardsville, IL area. Product availability may vary. Contact us for the most current availability on this product.